I took this one off the shelf at the library the other day because it was my lunch break and -- gasp! -- I'd left my book at home. The horror! But The Good Soldier by Ford Madox Ford was a) on my Classics Club list and b) short, under 200 pages, so it seemed like a win-win. It's a very short book, and yet I could talk about it for hours. What seems a straightforward, though tragic story is eventually revealed to include a lot of twists and turns, with lies and hypocrisy and characters you just want to shake or smack upside the head. The ending left me flabbergasted and full of questions, and I so wish that I had chosen this book to discuss back when I belonged to a face-to-face classic book discussion group a few years ago. This book was published 100 years ago, in 1915, and I imagine it was groundbreaking for its time, mostly because of the style of writing -- I wouldn't call it stream-of-consciousness, but it doesn't really follow a linear progression. It digresses and rambles, but it's still really insightful and beautifully written. The Ashburnhams are trapped in a loveless marriage, yet they are loathe to admit it or even consider divorce. The Dodwells are from old moneyed families from the northeastern U.S., but I imagine that's fairly similar in regards to the upright, "stiff upper lip" sort of attitude of most of these characters. As I was reading it, I immediately recalled another book that really stuck with me, Graham Greene's The End of the Affair, which I finished just a few weeks ago. I can definitely see how Ford must have influenced Greene -- the two books are almost companion pieces, with Greene's being the flip side, the adulterer instead of the cuckolded husband. The marriages of these characters are both tragic and heartbreaking, but at the same time, I felt like the characters mostly deserved what they got, in the end -- yet another case of fascinating train wrecks. Once again, the Classics Spin picked a winner! I'd had this book on the TBR pile for several years, ever since I read Gaskell's Wives and Daughters, one of my all-time favorite books. I read Gaskell's first novel, Mary Barton, a few months ago, but in my opinion Sylvia's Lovers is the superior book. Set in the late 1700s, this is the story of Sylvia, a young woman living in Yorkshire, and the two men who love her. The story begins with an incident of press-gangs, who were basically kidnapping men and forcing them against their will to become sailors for the British Navy, serving in the war against the French. A whaling ship, just returning after months at sea, is intercepted by a press-gang, and instead of returning to the welcoming arms of their loved ones, are immediately pressed into service and forced to return to sea to fight. The press-gangs were feared and hated in the late 18th century, and are key plot points in the story. Young Sylvia Robson is 17 and the prettiest girl in town. Her cousin Philip Hepburn, a draper, has always been in love with her, but she finds him dull and pedantic. Her head is turned by a daring sailor, Charlie Kinraid, who is wounded in a skirmish against a press-gang. Charlie has a reputation as a heartbreaker, and Philip is jealous. A tragedy occurs, and Philip withholds information which could either hurt Sylvia, or give her hope. Meanwhile, a young woman who works with Philip is in love with him, and another draper's clerk is in love with her. Basically, it seems like nobody will be happy in this story. Philip struggles with moral dilemmas, and the threat of war and the press gangs loom, and tragedy ensues. Overall, I liked this book much better than I expected. I'd been put off reading it for years, mostly because I didn't think it would measure up to Wives and Daughters or North and South, two of Gaskell's best-loved works. Also, I found Mary Barton to be kind of preachy. It's a Gaskell's only historical novel, but I've been more interested in the Victorian period than the Napoleonic era. However, a couple of months ago I started reading the Poldark series, and though that's set in Cornawall, the opposite end of England, it's nearly the same time period, and that gave me a little courage. I was also dreading it a little because I'd heard much of it is written in dialect, which it is, and that was somewhat hard to get through. However, I found the story pretty compelling; in particular, I thought Philip was a really well-rounded character, and I thought Gaskell did a good job with his moral dilemma. I did find Sylvia to be a fairly flat character, however. Honestly, she didn't have much personality -- other than being the prettiest girl in town, there's not much to her. She's a basic stock ingenue, like Charles Dickens' creations, which disappointed me. Also, the ending does sort of wallow in melodrama. Overall, a good read, though not quite up to the standard of Gaskell's very best work. It was a pleasant surprise and now I'm nearly finished my Classics Club list, only 13 books to go! I'm looking forward to the next Classics Club spin! I'm also counting this for the Reading England Challenge (Yorkshire). 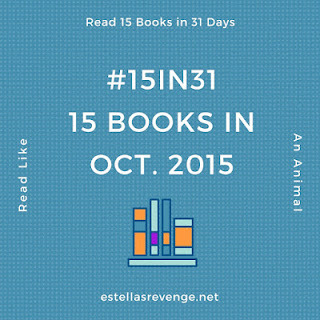 Allie at A Literary Odyssey posted an interesting challenge for which she'd signed up: to read 15 books in 31 days! In September, I had a stellar reading month, completing 14 books (though to be fair, I'd actually started Wilkie Collins' No Name in August; However, it's a really long book, so I'm counting it anyway.) 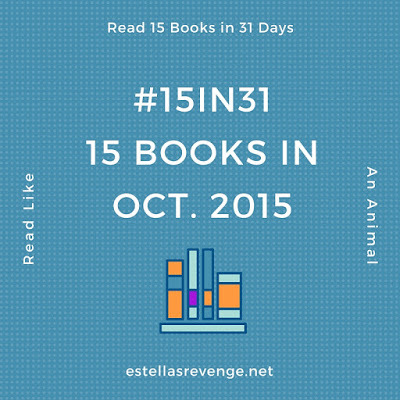 I'm pretty sure I could get close to 15 books in October if I try. I have some airplane travel coming up, plus a lot of books left on the TBR shelves I'd like to complete. 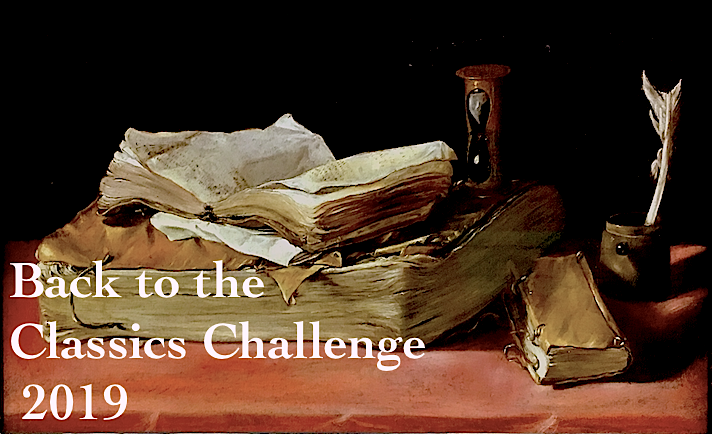 Even if I don't finish the challenge, I'll have made some progress -- I'd love to knock at least 10 books off my owned-and-unread list! Tea by the Nursery Fire by Noel Streatfeild. I'm on an online group and it's part of a bi-monthly book exchange -- I need to read it and send it off to the next person by November 1. It looks like a charming memoir, just my type of book. 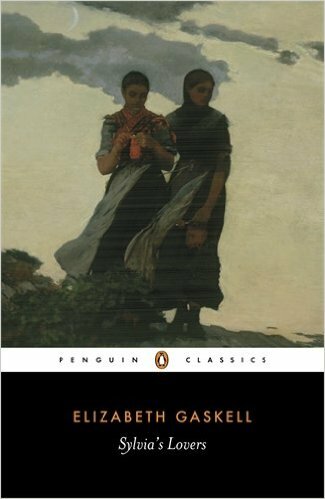 Sylvia's Lovers by Elizabeth Gaskell -- I've already started this one, which was randomly selected as Classics Club Spin Pick #10. I'll hopefully be posting a review on October 23. Might be a slow read, because everyone speaks in dialect, but it's pretty good so far. Letters From Hawaii by Mark Twain. One of the last books for my TBR Pile Challenge 2015. The Black Moon by Winston Graham -- the fifth book in the Poldark series. My library only owns one copy and there are holds on it, so I have to read it in the next week or so. The Four Swans by Winston Graham (not pictured, as it's waiting on the hold shelf for me at the library). Again, only one copy, and holds on it. I'm trying to stretch them out, but I don't want to miss my turn to read it. Sir Harry Hotspur of Humblethwaite by Anthony Trollope. 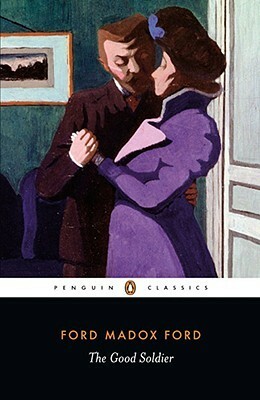 I haven't read any Trollope in months, and I'm starting to miss him. This one is super short, and I've always found the title amusing. Lucky Jim by Kingsley Amis. One of the shortest books on my Classics Club list. I've tried to read it twice but couldn't get into it. Again, time to read it, or give it away. Aiding and Abetting by Muriel Spark -- another library sale find, a novella. Tea with Mr. Rochester -- I have to include at least one Persephone from the TBR shelves! Short stories are always a good choice, and it's a tiny slim volume. Alexander's Bridge by Willa Cather. One of her early works, and it's been on my TBR shelf since I bought it at the Borders clearance. Plus it's really short. The Bottle Factory Outing by Beryl Bainbridge. Purchased about eight years ago after I saw it on a list of the best English-language books of all time. I need to read it, or get rid of it. The Mystery of Edwin Drood by Charles Dickens. I'm down to 14 more books on my Classics Club list, and this fits in nicely with RIP X. The Pumpkin Eater by Penelope Mortimer. I have a weakness for NYRB Classics. Plus, it has "pumpkin" in the title, and it's October, so that's as good an excuse as any, right? The Skin Chairs by Barbara Comyns. From my pile of Virago Modern Classics. I just read Our Spoons Came From Woolworth's and loved it, so I want to read more books by Comyns. The Mysterious Death of Miss Austen by Lindsay Ashford. I don't read a lot of Jane Austen fan fiction, but the author was a speaker at the Jane Austen AGM a couple of years ago, and it sounded interesting. Also a good choice for RIP X. An Academic Question by Barbara Pym. Pym's never disappointed me! I haven't read any of her books in over a year, so it's high time for another. Ha'penny by Jo Walton. Sequel to Farthing which I read last week, and loved. Still Glides the Stream by D. E. Stevenson. In case I need a quick, easy read. Stevenson's books are fun, light mid-century fiction. I picked this one up at the library sale a few years ago for $1. The Little Friend by Donna Tartt. I finally got around to reading The Secret History and tore through it, so I should have no trouble finishing this one, if I don't decide to put it off for a few months -- it's the only one of her books I haven't read, and it'll probably be another eight years until she publishes another, so I might want to stretch it out a little. So -- any recommendations? Which books should I push to the top of the pile? I highly doubt I'll get all these finished, but it sounds like a fun challenge! Sign up at Estella's Revenge if you're interested. I'll be sure and post about how it turned out, and which books I actually finished.